CULLMAN – Cullman resident and Vietnam veteran Gerry Howard was recently awarded one of the Army’s most prestigious awards for veterans of the Infantry. FORT CARSON, Colo. – The 4th Infantry Division hosted an Iron Horse Week pass and review ceremony Aug. 17 at Founders Field on Fort Carson. Prior to the march, a 4th Inf. Div. alumnus received the Order of St. Maurice Medal from Sgt. Maj. of the Army Daniel A. Dailey and 4th Inf. Div. and Fort Carson Commanding General, Maj. Gen. Ryan F. Gonsalves. Gerry Howard, (a) Cullman, Alabama, resident served with Alpha Company, 1st Battalion, 8th Infantry Regiment, 4th Inf. Div., from May 1969 to March 1970 as a draftee platoon leader. He started in the mid-1980s building local memorials and placing markers around Alabama recognizing the accomplishments of veterans especially in the 4th Inf. Div. In 1998, Howard was given the mission to build a 4th Inf. Div. memorial in the Washington D.C. area. The memorial was dedicated at the entrance to Arlington Cemetery on July 5, 2001. Since then he has been chairman/facilitator of nine other memorials, mostly 4th Inf. Div. and its regiments. He also participated in the Non-Commissioned Officer Candidate Course memorial "Shake & Bakes" at the National Infantry Museum at the U.S. Army Maneuver Center of Excellence, Fort Benning, Georgia. Howard has spent most of his adult life helping to memorialize not only the 4th Inf. Div. but also helped with many others. 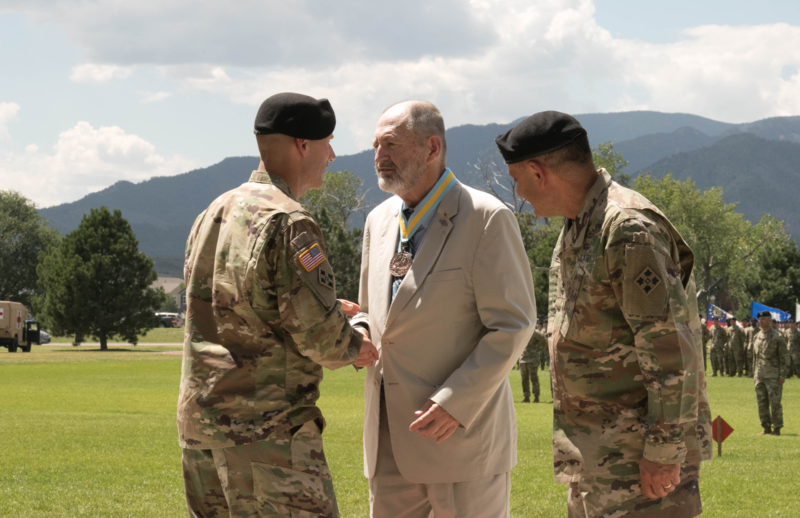 The Order of Saint Maurice Medal recognizes those who have served the infantry community with distinction; must have demonstrated a significant contribution in support of the Infantry; and must represent the highest standards of integrity, moral character, professional competence, and dedication to duty. As one of the final events of Iron Horse Week, Gonsalves, along with Command Sgt. Maj. Richard L. Ayala, Jr., 4th Inf. Div. and Fort Carson acting command sergeant major; Retired Gen. Raymond Odierno, former chief of staff of the Army; and Dailey, conducted an inspection of troops, in conjunction with the centennial of the division. During the pass and review, more than 1,000 active-duty Soldiers, local Colorado veterans and National 4th Infantry (Ivy) Division Association veterans marched in the ceremony. The Soldiers and veterans were escorted by Soldiers in era-specific uniforms, representing the lineage and future of the division. Iron Horse Week was a four-day event which gave an opportunity to Fort Carson units to participate in competitive events, as individual Soldiers and teams. Soldiers and units from across Fort Carson competed in a variety of tournaments and competitions to earn the division Commander’s Cup. Events included basketball, flag football, softball, ultimate Frisbee, combatives, combat swim, golf, marksmanship, medical stakes and orienteering. The 2nd Battalion, 77th Field Artillery Regiment, 2nd Infantry Brigade Combat Team, 4th Inf. Div., was recognized as the top unit of the week.